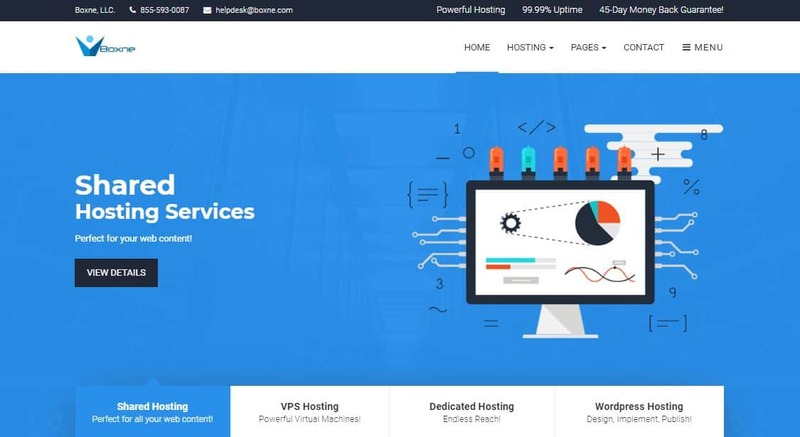 Boxne Review 2019: Is Boxne a Good Hosting? Boxne is an impressive website host located in the U.S. Not only do they have an excellent uptime guarantee, they offer great features for advanced users, and good customer service. Boxne is a U.S. based website company founded in 2010 that offers only cloud based hosting services. Since inception, they’ve registered more than 2,500 domains, with more than 400 clients. Their website and support are available in English only. Boxne offers a comprehensive selection of cloud-based website hosting services including shared hosting, WordPress hosting, reseller hosting, virtual private servers, and dedicated server rental. Boxne has servers located in three separate data centers in the U.S., however they don’t provide very much information about the specifications of the centers. That said, they do offer a 99.99% uptime guarantee, backed with a service level agreement. They use solid state disk drives, which are far faster than traditional disk drives. Beginners may be a little disappointed that they don’t provide a website builder and that the one-click installer is only for 125 programs. However, advanced users will love the support for the latest version of PHP, as well as Python and Perl. They also have FTP, SFTP, and SSH access. All plans also come with website visitor statistics, cron jobs, and CageFS. They offer three packages of shared hosting plans: Basic, Pro, and Business. The plans range from 2GB disk space to unlimited and 20GB bandwidth to unlimited. The plans are well priced compared to both international and local competitors, especially given the support for advanced features. Their plans are available in one, three, six, and twelve month terms and the monthly price is very heavily discounted when you purchase a longer term. They offer a generous 45-day money-back guarantee, as well as a free domain for annual plans and free SSL certificates for all, except the basic plan, accounts. In terms of customer service they offer email, live chat, telephone, and a ticketing system. They provide 24/7 email and ticket support and live chat and telephone during business hours of 9AM to 9PM PST. They advertise a response time of up to four hours, which is okay, but not world class. They also have a very good knowledge base on their website. Each time I’ve contacted them on live chat, they’ve responded quickly and helped me with my request very efficiently. Boxne offers a good selection of services, with a great uptime guarantee. They’ve grown significantly from 2010, and they’ve helped more than 500 clients and written almost ten million lines of code! Wondering how Boxne stacks up against other Web Hosting companies? Enter any other Web Hosting company and we will give you a side-by-side comparison.